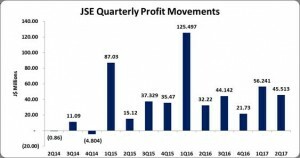 JSE reports 35% decline in six months Net Profit but saw 41% increase for second quarter. Cess income declined 44% to $126.37 million relative to $226.50 million the previous year. Fee income grew $66.01 million to close the period at $295.24 million (2016: $229.23 million). E-campus showed a slight decline of 1% to $7.94 million, relative to $8.06 million in 2016. Other operating income rose 28% during the period to total $48.10 million compared to $37.72 million in 2016. Staff Costs had a 14% increase for the period totaling $78 million (2016: $134.35). Depreciation and amortization totaled $55.58 million relative to $43.34 million in 2016. Professional fees amounted to $26.20 million, a 37% increase year over year. Other operating expenses increased by 6% to $20.09 million from $18.99 million the previous year. Advertising and promotion increased from the $28.14 million booked in 2016 to $34.42 million. This was due to “promotion of new and existing products and services and the paving of new paths for additional revenue generating products”. Investment income moved from $24.20 million in 2016 to $10.81 million, reflecting a 55% reduction year over year. Consequently, profit before tax totaled $158.65 million compared to $233.79 million the year prior. For the second quarter, the company reported a 58% increase in profit before taxation totaling $74.09 million compared to $47.02 million the prior 2016 quarter. Tax charges for the period decreased to $56.89 million relative to $76.08 million the prior year. As such, JSE reported a net profit of $101.75 million for the six months compared to a profit of $157.72 million for the prior year, a 35% decline. However, Net Profit for the quarter increased by 41% to total $45.51 million compared to $32.22 million the year prior. Earnings per share for the six months totaled $0.15 compared to $0.22 in 2016, while the trailing earnings per share amounted to $0.24. The numbers of shares used in the calculations are 701,250,000 units. Shareholders’ Equity amounted to $891.43 million (2016: $708.06 million), resulting in a book value per share of $1.27 (2016: $1.01).